In terms of preserving you for posterity, how could any intellectual be more fantastically lucky than to be the subject of a very loving, and very readable novel that also happens to be the apex of a Nobel Prize winner’s output? I have never read a better Saul Bellow novel than his last, Ravelstein, which basically details the life of philosopher Allan Bloom, who was one of Bellow’s fellow professors at University of Chicago. It’s fantastic, you should read this. The Bloom-character in that novel is an amazing study in contrasts. He’s this very passionate, very gay, and very conservative thinker who’s suddenly become one of the most famous men in America (because of this book). After reading Ravelstein (four years ago), I decided to read this book. About a year ago, I acquired a copy. Last Sunday, I decided to give away every single book that I wasn’t absolutely sure I was going to read. 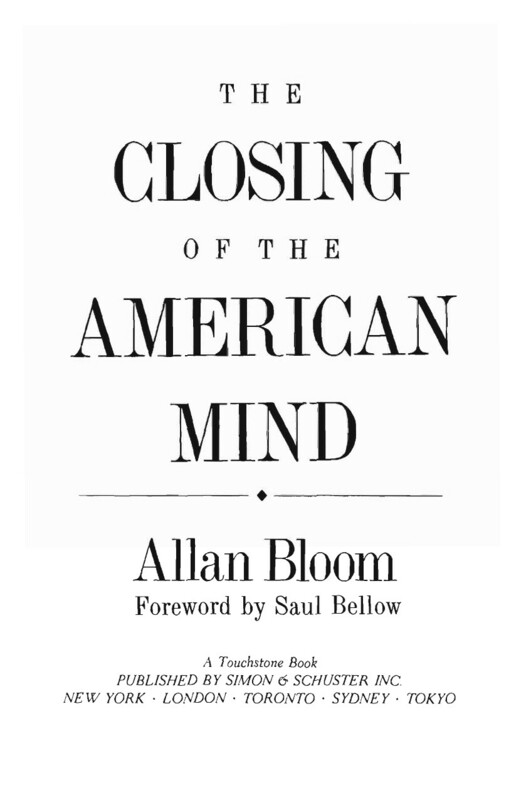 I figured that if the time ever did come to read The Closing of the American Mind, then I could come by another copy. The very next day, I realized that it was time to read this book, so I bought a copy off Amazon and read it in two days! I basically spent all of Monday reading it. I was blown away. I’ve never read a polemic that was so concise and forceful and deeply-felt and still-relevant. The closest would probably be The Feminine Mystique. But, despite that book’s many virtues, it’s not particularly well-argued: Friedan’s book is one whose argument you’re either drawn to or not. Whereas I think that Bloom makes a pretty sound case for its believes. To wit, he thinks that American students (and, by extension, American adults) have lost the ability to live with and within ideas. He lays the blame at the door of relativism. According to him, almost every student comes to college believing in some form of relativism: the idea that truth is unknowable and that one person’s truth is as good as another person’s. Now, you’re probably tut-tutting me and being like, “Nuh uh, dude. Americans believe in stuff.” But that’s because I’m not Bloom. Go and read the book. He lays it out pretty solidly. Personally, I am a relativist. I do not believe in absolute morality or in right and wrong on any level, whether it’s the notion that some books are better than others or that some ways of life are better than others. But that does lay me open to some problems. Like, if you’re a relativist, then how do you make decisions? I mean, that’s not even the problem. The problem is…I do make decisions. I make decisions every day. I decided that one way of life was better (for me) to live than another. I decide that some books are better. I try and impose my decisions on others (by telling them what books are better). Something happens within me all the time, but I am completely inequipped with an intellectual framework for understanding or even thinking about the decisions that I am making. And that’s what the book is about. Bloom doesn’t quite say that there is such a thing as some stuff being better or more moral than other stuff, but he makes a very impassioned case that relativism is a much better ending point than it is a starting point…that people should at least be exposed to the old truths before they learn that they are lies. The colleges do not have enough to teach their students, not enough to justify keeping them four years, probably not even three years. If the focus is careers, there is hardly one specialty, outside the hardest of the hard natural sciences, which requires more than two years of preparatory training prior to graduate studies. The rest is just wasted time, or a period of ripening until the students are old enough for graduate studies. For many graduate careers, even less is really necessary. Which is fine, I guess, but it’s of no real use to either you or the world. Unless you learn how extract some kind of truth from the world, then what you’re doing is not thinking. But much of the humanities starts from the assumption that there is no truth to be gotten: there’s merely some sort of free-flowing line of association. Analysis is an activity in and of itself. Outputs are evaluated, if at all, merely on the basis of elegance: not on the basis of truthfulness or utility. Personally, I learned much more in high school than I did in college, because my high school concentrated on giving me a lot of knowledge. And I’ve learned much more from my own reading since I graduated college, because I am able to hold myself to much higher standards than my university ever did (not that I would’ve welcomed a firmer hand from my university–I just would’ve liked it to be a bit less snooty about what it was really giving us). P.S. I feel that I haven’t done justice to or accurately described the content of the book. Most of it (maybe 1/2) is a very detailed discussion of the intellectual forebears (primarily Nietzsche and Weber) whose thought led us to this impasse, which additional discussion of others (Descarte, Plato, Locke) who offer us some kind of alternative. “I do not believe in absolute morality or in right and wrong on any level, whether it’s the notion that some books are better than others or that some ways of life are better than others. But that does lay me open to some problems. Like, if you’re a relativist, then how do you make decisions? We are enough on the same page here that you might find useful my resolution to this dilemma. Just because you reject an unconditional sense of right and wrong doesn’t mean you can’t still employ the conditional sense of right and wrong embodied in your *preferences*. A rock does not care about the state of the universe. If the universe was just rocks, it really wouldn’t matter what happened. In order for there to be a meaningful sense in which some states of the world are better than others, there has to be someone who cares. The *starting* point is some agent with preferences over states of the world. You have preferences. I have preferences. Dogs have preferences. What preferences do is they rank states of the world so that some are better than others according to a set of preferences. Like you I am a relativist. But that doesn’t mean I can’t have perfectly well-defined preferences that I use to make decisions. These preferences were a product of evolution and culture and experiences, but it ultimately doesn’t matter where they came from, or “why” I have them. They are my preferences! My preferences are my preferred way of ranking states of the world, so of course I will use them to determine what is better *to me*, with no pretension that there is anything objectively special about my particular preferences. Preferences are very general. My preferences encompass my system of morality. My preferences include an altruistic component that tells me how much to care about various other people and their preferences. My preferences include meta-preferences about how I would like my preferences to evolve over time. Does that help at all/make sense to you? What does it leave unresolved? The intellectual framework to understand how you make decisions is found in the social sciences. But my preferences are not clearly defined. If they were, I’d already know exactly what to do in every situation and would have no need for any kind of analysis. If you were building a computer that needed to do simple multiplication, you could get away with just giving it times tables up to 10×10, if that’s all you needed. Then, it would instantly know 7×3 without doing any work at all. But if it needed to handle much larger multiplications, it would be better to give it a small 10×10 times table *together* with an algorithm for multiplying arbitrary numbers using only knowledge of the 10×10 times tables. Now when the computer wants to multiply 517293 x 99421, it has to think for a bit instead of spitting out the answer instantaneously, as it would if we just gave it a very large times table. However, the decreased speed is worth the memory savings since the multiplication algorithm is tiny compared to a giant times table. Our brains are basically computers that evolution has designed to get us to maximize fitness subject to some pretty serious space constraints. In theory, evolution could figure out the optimal actions in every scenario and just hardwire the correct fundamental preferences into our brains. But in practice, our lives are far too complex for that to be optimal. Such an enormous times table would take an enormous amount of memory, and brain space is evolutionarily expensive. Instead, evolution has us do a lot of our own optimization in-house. It gives us a set of more basic values (we could call them meta-preferences), together with optimization software for turning those basic values into well-defined preferences to suit the situation at hand. So, rather than saying that our preferences aren’t well-defined just because it often takes internal analysis to pin them down, I would say that we are continually experiencing an ongoing optimization process that is itself well-defined. We experience what an algorithm feels like from the inside. The algorithm chugs along, and bits and bats here and there interact and make connections and cause other parts of the algorithm to execute, and in the end the algorithm accomplishes exactly what it’s supposed to. But all the little pieces didn’t have to be aware of the bigger picture in order for the algorithm to work. The process itself is well-defined and does not require any one entity to be aware of the entire algorithm. Evolution does not require or benefit from us having full self-awareness of how our brain is working, so it’s unsurprising that we are so mystified. Nevertheless, our brains are these deterministic machines that are working in a systematic way, and thus they are amenable to scientific analysis. Through observation and reasoning, we should ultimately be able to understand everything about them. The fact that we aren’t there yet does not hamper our brain’s ability to produce well-defined preferences for everyday use. I don’t disagree with the philosophical underpinnings of what you’re saying. Obv, I believe that we’re biological and so are all our preferences. However, our brain is incredibly hampered in its ability to produce well-defined preferences for everyday use. People do things all the time that don’t make them happy. Figuring out your preferences is the central drama of modern life. Someday science will assist us in this task, but right now it’s not doing jack for us. As such, the only tools of analysis we’re left with are the ones given to us by mankind’s great thinkers.